Rosa Boone has a disarming smile and a down-home, feel-good way of making you feel welcome. She can be flirtatious, too. When a visitor was announced in the downtown White Plains office of the nonprofit organization she oversees she matter-of-factly told the staff the gentleman was her date for the evening. Laughs and smiles all around. She has the right to be flirtatious, "I'm a Georgia Peach," she said with a faded Southern accent. The seventh of 10 children, Boone grew up on a farm about an hour's drive north of Atlanta in Calhoun. Her father would barter for items not grown or raised on the farm. And although her mother had 10 children of her own to care for, she always found ways to help neighbors and people less fortunate in the community. The young Rosa was reminded when she spied her mom preparing a food basket that "there are people who have less than you." It's a lesson she encountered again in the mid-1990s. Boone saw the good and the bad growing up before the Civil Rights Act of 1964 when segregationist Jim Crow laws still ruled the nation. While attending Knoxville College in Tennessee, she tried to change racist attitudes by participating in sit-ins at restaurants that wouldn't serve blacks. She simply wanted to state that "We're all human beings." But in the back of her mind, she thought, "Is my head going to get busted?" She left Knoxville before finishing the course work for a diploma and moved to New York City where a sister and aunts and uncles lived. Boone worked for Nielsen Television Ratings and later at CBS, where she met recording executives and artists of the day such as Clive Davis, Sly Stone, Janis Joplin and Jimi Hendrix. She moved to New Rochelle where she raised a son and was an executive with Corporate Audit Company Inc. dealing with auditing ad expenditures. Despite her busy schedule she said she felt that "There has to be another dimension to me." She found it when she decided to return to college and earned a bachelor's degree inpsychology and a master's in gerontology from The College of New Rochelle. While she was juggling her work and college studies, a neighbor asked if she would like to play tennis. Growing up in Georgia, Boone played softball, baseball and basketball and ran track. Tennis was one sport that eluded her; it was a white sport and the ability for her to step on a court in the South was not possible. She decided to give tennis a shot. Despite her initial propensity to hit home runs,she persisted. She took lessons to control her power and aim. Tennis became a new love. She joined a USTA teamand now. "I'm a 4.0 player; 7.0 means you're a professional." That tugging about doing more in life came after she was downsized from the New Rochelle company. The Westchester Coalition of Food Pantries and Soup Kitchens needed a public information director. Boone aced the interview and started writing and observing. In late 1995, she visited a soup kitchen at Grace Church in White Plains and said she found that these were just regular people. "Things happened to them," she said. "I'm a spiritual person. I asked the Lord if you help, I'll help." She said it was a great organization that just needed some direction. She wrote a job description and after coordinating the coalition's first annual gala benefit in October 1996 became its executive director with a budget of $70,000. Two years later, the organization joined the Coalition of the Homeless of Westchester to become The Westchester Coalition for the Hungry and Homeless Inc.
Boone is responsible for overseeing the efforts of 143 service providers in Westchester, including 38 soup kitchens, 72 food pantries and 33 shelters serving some 240,000 people, of whom 50 percent are children. "These are innocent children. As part of a civilized society we all share a responsibility." With such an onerous task, one would think she has a well-buttressed support staff. Think again. In addition to herself, there is Susan Aubry, director of development, and two part-timers to help with an eviction prevention program and clerical work. Long days are her life. People even come knocking on the door at 48 Mamaroneck Ave. asking for groceries. "How can I find food?" others ask. Dealing with other people's hardships "takes a lot out of you," she said. Boone said she's happy she has tennis and Joe Curto, owner of the Yonkers Tennis Center, who donates court time to her. Playing with the Passing Shots tennis team allows Boone time to decompress. On Monday nights it's mixed-league play from 6:30 to 10 p.m., Wednesdays it's the women's league at Concordia College and Thursday nights, the courts in Yonkers. 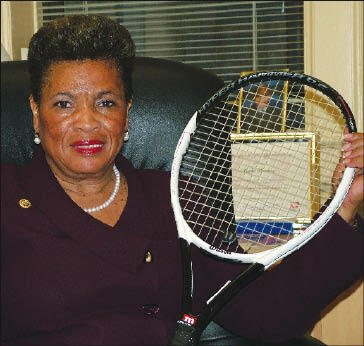 She also plays against Mount Vernon Mayor Ernie Davis, of whom she says, "If I took lessons, I know I'd beat him." The mayor offered this retort: "I don't think any lessons in the world would help her." But he did add, "She's a hell of a tennis player. Although I played her yesterday and she did finish second." And the final word from Boone: "I still say if I took lessons, I'd have a serve like him." The coalition is holding its 9th annual gala and awards dinner April 27 at Tappan Hill in Tarrytown. For information, call 682-2737 or visit www.foodclothingshelter.org.